In this class we discussed the current situation in Mexico after the Natural Disasters last week. Recommended Previous Knowledge/abilities: To be able to describe experiences, events, wishes, and aspirations; briefly justify your opinions or explain your planes.to know the present subjunctive and the perfect preterite of the subjunctive. past participle conjugation. 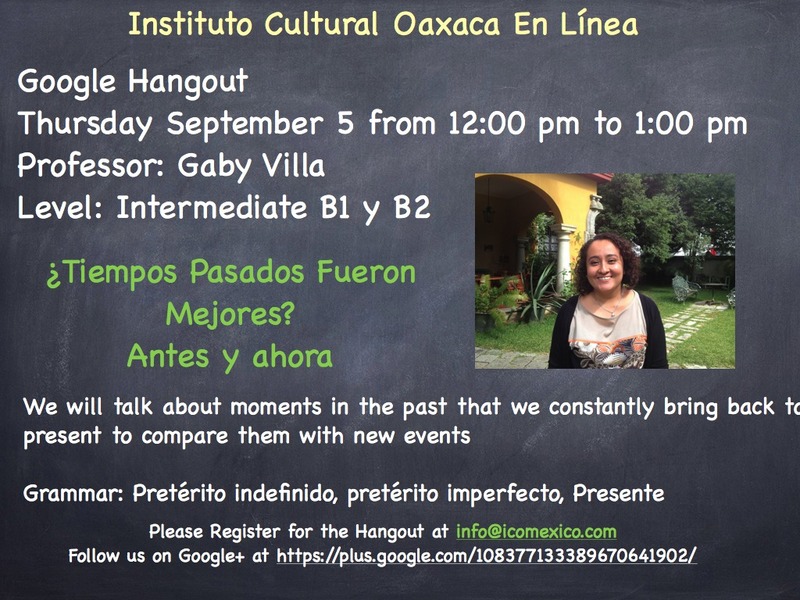 The Instituto Cultural Oaxaca invites you to participate in a public class through Google+ Hangouts every thursday at 12:00 pm central time. Función comunicativa: Expresar deseos, opiniones y consejos sobre acciones pasadas y futuras. Gramática: Diferencia entre Presente y Pretérito Perfecto del modo Subjuntivo. Nombre del maestro(a): Omar Lemus.